Being a business in this day and age offers a staggering array of advertising choices, and Facebook has just added another. Now that they are trading publicly, Facebook has to continually come up with creative ways to make money for investors. Their latest attempt is to experiment with monetizing user content. 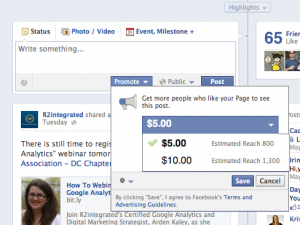 Now, if your Page has 400 likes (yes–you read that right: 400), you can promote your posts via Sponsored Stories. You pay Facebook to highlight your posts, and when someone likes your page, their friends will also see those posts in their newsfeeds, thus leading to more user reach and (so Facebook hopes) user engagement. You control how much you spend daily or for the entire campaign. You are only charged for the number of clicks or impressions your ad receives, and once your budget is reached, the sponsorship ends. This video helps explain the process of promoted posts. This could be a wonderful tool, or backfire horribly, depending on any number of factors. Our advice is, if you try it (once you reach that magic number of 400 likes, that is), choose your posts carefully and don’t become a spammer. Else your likers will become unlikers very quickly. Here at Smellycat Productions, we make it our top priority to help your business succeed and understand the madness of Social Media. This medium of promoting and advertising is doing nothing but growing, and can’t be beat for price, reach, and broadcasting your business as a whole–IF done correctly. Call or email us today to learn more, or to schedule a private social media workshop.